Afghanistan is, among other things, a country of poets. Men recite poetry apothegmatically, unprompted. They quote Rumi, who was born in Balkh in 1207. They quote Omar Khayyam, who lived in Persia a thousand years ago, and Hafez, who composed his mystical verses in the 1300s. Young Afghan men declaim their own poems to each other over endless cups of tea. Women trade landays—unrhymed, bitter, teasing, and proverbial two-liners composed in Pashto and repeated over decades, over centuries—and prostrate themselves beside the tomb of Rabia Balkhi, who, in the tenth century, became the first woman known to write poetry in both Arabic and Farsi. Poetry is “probably the most important aesthetic medium of traditional Afghan society,” writes Faisal Devji, a historian at Oxford University. Since most Afghans cannot read or write, most of Afghanistan’s poetry is oral, unrecorded—and, to the Anglophone audience, largely unknown. But here is Poetry of the Taliban, an anthology of two hundred poems in English translation. The editors, Alex Strick van Linschoten and Felix Kuehn, researchers and writers who live in Kandahar and who have worked in Afghanistan since 2006, spent years accumulating poems they found on Taliban websites while doing research for unrelated projects. Four Afghan interpreters helped with the translations. Some poems originally appeared on AfghanWire.com, an informal media monitoring database and newsletter that Strick van Linschoten and Kuehn founded in 2006. Kemp misses the fundamental contribution of this collection. The book reveals no Afghan literary giants. Most of the poems are inelegant, their imagery clunky. (“My friend! Safeguard the dignity of your homeland in the world;/ Drive out the crow from this garden,” exhorts a Talib named Matiullah Sarachawal.) Most resort to simplistic metaphors. (“When the heart dies; the body has to die and it will die./ Freedom is the heart of each nation’s body;/ Without it, both the nation and eternity die,” lectures Abdul Shukur Reshaad.) But today’s literature about Afghanistan is dominated by non-fiction, penned mostly by Westerners—memoirs by former military personnel, studies of the Taliban by analysts, prognoses by counterterrorism experts. In this literary landscape, Poetry of the Taliban may be one of the most revealing sources of how Afghans actually feel. The volume’s interest is not so much literary as it is anthropological. This is cruel, O my creator! It is true: the stanzas are chock full of cheap tropes. But this callowness, combined with the unalloyed emotional charge, offers a window into the uncompromising romantic ideas that have urged men into battle since time immemorial. Whether the Afghans in the poems are helpless victims, as in Shin Gul Aajiz’s ghazal, or victorious warriors (“Nations are amazed by Afghans,/ Since they have beaten a power like Bush,” a Talib named Hanif prophesied in 2008); whether they extol the natural beauty of their land (“A yellow ray among a few branches of crowded tree,/ Will shine in the forest just like a candle”), or condemn the violence that wracks it (“A hot bazaar of cruelty is being made out of beautiful Kabul”)—or even, in a break from the bravado that saturates the book, blame themselves for Afghanistan’s devastation (“It’s a pity that we are wandering as vagrants,/ We did all of this to ourselves”)—the poems reflect the chauvinistic and sentimental heart of the guerrilla movement that is wearing down yet another band of foreigners trespassing on Afghan soil. At times the tone of the poems in the anthology seems at odds with the Taliban’s muscular image. Their authors are weakened by lost love, ravaged by grief. “Your love aside, what else is there?/ It is like approaching the desert,” writes Pordel Bustan. “Like a flower withering in the autumn,/ Autumn has now come to my love,” grieves Shahzeb Faqir. In a way, such sensuous serenades lend credibility to the rest of the volume: the unfeigned fragility of some of the authors makes the political manifestos of the rest appear more genuine, more honest. What motivates the authors is a sense of violation and abandonment, combined, by Afghanistan’s de facto powerbrokers. These are sentiments shared not just by Taliban rebels but by much of the country’s beleaguered people. 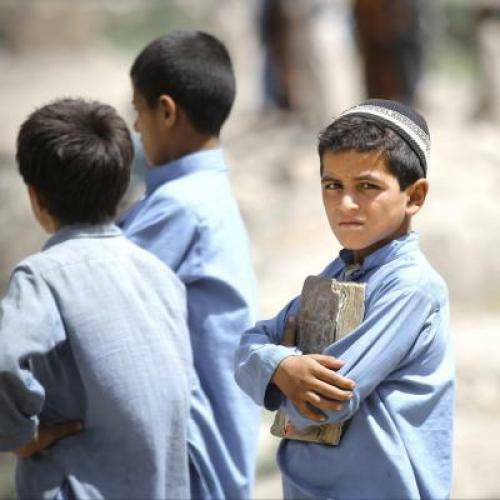 International donors have contributed more than $60 billion to Afghanistan since 2001, and some of this money was supposed to bring free healthcare, deep-water wells, schools, and electric power to villages, where most Afghans live. Because of mismanagement and corruption, it barely has. The absence of the most basic necessities is one explanation for why Afghanistan has the highest infant mortality and the fifth-lowest life expectancy in the world. In the years I have spent trudging through Afghanistan—in public buses, on foot, alongside pack animals—I have heard the complaints and hopes and frustrations that permeate the poems from Afghans who had little affinity with the Taliban: housewives and farmers, hunters and opium dealers, taxi drivers and businessmen. And herein may lie the most revealing, and the most cautionary, aspect of the book. These poems from the Taliban are certainly insurgent propaganda, but they are also more than that. The rage, the frustration, the sense of wounded honor they express reflect the feelings of most Afghans. The 247-page volume allows us first-hand access to the sentiments of a people the West still knows too little about, even after more than eleven years of occupation. With the NATO troop pullout less than two years away this candid look into the hearts of Afghans may be overdue. But it’s not too late. Anna Badkhen is the author of, most recently, Afghanistan by Donkey. Her upcoming book, The World Is a Carpet, will be published next spring.